A precise photoelectric instrument for measuring the position of a celestial body. 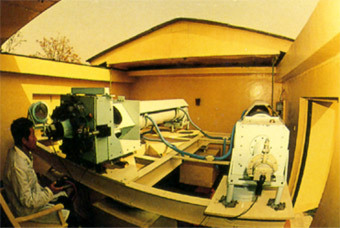 Its main optical system is a Shmidt telescope with an aperture of 240mm (9.5")and a focal length of 2665mm (f/11). It is different from a traditional meridian circle in that it adopts a rotatable mirror to replace the telescope mount for pointing the instrument, thereby any error caused by tube flexure is avoided.